Mindshift reveals how we can overcome stereotypes and preconceived ideas about what is possible for us to learn and become. At a time when we are constantly being asked to retrain and reinvent ourselves to adapt to new technologies and changing industries, this book shows us how we can uncover and develop talents we didn’t realize we had—no matter what our age or background. We’re often told to “follow our passions.” But in Mindshift, Dr. Barbara Oakley shows us how we can broaden our passions. Drawing on the latest neuroscientific insights, Dr. Oakley shepherds us past simplistic ideas of “aptitude” and “ability,” which provide only a snapshot of who we are now—with little consideration about how we can change. Even seemingly “bad” traits, such as a poor memory, come with hidden advantages—like increased creativity. Profiling people from around the world who have overcome learning limitations of all kinds, Dr. Oakley shows us how we can turn perceived weaknesses, such as impostor syndrome and advancing age, into strengths. People may feel like they’re at a disadvantage if they pursue a new field later in life; yet those who change careers can be fertile cross-pollinators: They bring valuable insights from one discipline to another. Dr. Oakley teaches us strategies for learning that are backed by neuroscience so that we can realize the joy and benefits of a learning lifestyle. Mindshift takes us deep inside the world of how people change and grow. Our biggest stumbling blocks can be our own preconceptions, but with the right mental insights, we can tap into hidden potential and create new opportunities. Barbara Oakley is a professor of engineering at Oakland University in Rochester, Michigan, and Ramón y Cajal Distinguished Scholar of Global Digital Learning at McMaster University. Her research involves bioengineering with an emphasis on neuroscience and cognitive psychology. Dr. Oakley teaches two massive open online courses (MOOCs), "Learning How to Learn" (the world’s most popular course) and “Mindshift” (based on this book), alongside legendary neuroscientist Terrence Sejnowski. Dr. Oakley has received many awards for her teaching, including the American Society of Engineering Education's Chester F. Carlson Award for technical innovation in education and the National Science Foundation New Century Scholar Award. "Significant change is possible. With those four hopeful words, Barbara Oakley opens the door to an entirely new way of seeing and reaching our potential. Don't hesitate, it matters." "Mindshift is a fantastic book about how we learn and how we can use our talents (or learn new ones) in order to create a more satisfying career for ourselves. If you're stuck in a rut and don't know what to do next in life, this is a phenomenal resource to help you find your way. Dr. Oakley is a master of storytelling and of sharing ideas that can help inspire you to get out of your comfort zone and learn!" "Brace yourself: This book will change your entire perception of what you thought was possible. Barbara Oakley will make you realize that you can change—and change quite profoundly—by making just a few tweaks to how you learn, and she will show how these methods are becoming increasingly available to everyone. Upgrade your mind, upgrade your life, with this book." "Open this book to open your mind. 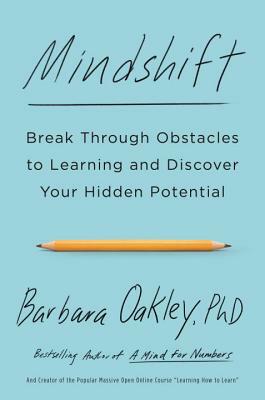 In Mindshift--both a collection of inspiring stories and a field guide to creating change--Barbara Oakley shows how deep learning, deep practice, and deep transformation work and drive progress and possibilities." "Oakley profiles a variety of men and women who have left successful careers in one field to become novices in another. By bringing along their accumulated knowledge and applying her study tips, they have been able to view new bodies of knowledge from fresh viewpoints, often achieving amazing results. . . . The author has an international scope and gleans examples from a variety of locales and age groups."